Andersen, A.G. et al. 1976. Den danske mosflora. I. Bladmosser. Gyldendal. Hallingbäck, T., Lönnell, N., Weibull, H., Hedenäs, L. & von Knorring, P. 2006. Nationalnyckeln till Sveriges flora och fauna. Bladmossor: Skjöldmossor - blåmossor. ArtDatabanken, SLU, Uppsala. Hallingbäck, T., Lönnell, N. & Weibull, H. 2008. Nationalnyckeln till Sveriges flora och fauna. Bladmossor: Kompaktmossor - kapmossor. ArtDatabanken, SLU, Uppsala. Hedenäs, L., Reisborg, C. & Hallingbäck, T. 2014. Nationalnyckeln till Sveriges flora och fauna. Bladmossor: Skirmossor - baronmossor. ArtDatabanken, SLU, Uppsala. Hedenäs, L. 2003. The European species of the Calliergon-Scorpidium-Drepanocladus complex, including some related or similar species. - Meylania 28: 1-116. Kan bestilles fra: Bruno Bagutti, Talstrasse 9, CH-3122 Kehrsatz, Schweiz. Nyholm, E. 1954-1969. 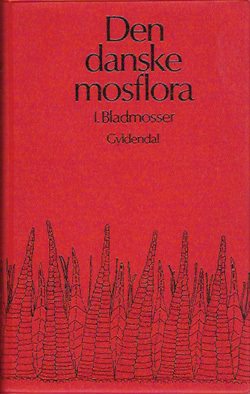 Illustrated Moss Flora of Fennoscandia II. Fasc. 1-6. Musci. Lund. Nyholm, E. 1986-1998. 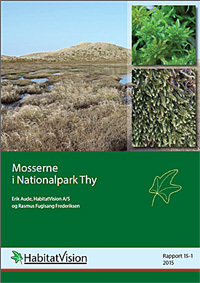 Illustrated Flora of Nordic Mosses. Fasc. 1-4. Nordic Bryol. Soc., København & Lund. Goldberg, I. 2005. Vejledning i bestemmelse af bladmosser. Mossornas Vänner. 2010. Vitmossor i Norden. Uppsala. 130 s.
Flatberg, K.I. 2014. Norges Torvmoser. Fagbokforlaget. Flatberg, K.I. 2002. The Norwegian Sphagna: A field color guide. - NTNU Vitenskapsmusset Rapp. Bot. Ser. 2002-1. Goldberg, I. 2013. Sphagnum-feltguide. - Aglaja. 93 s.
Laine, J. et al. 2018. Sphagnum mosses - The stars of European mires. - University of Helsinki, Department of Forest Sciences, Sphagna Ky, Helsinki. 326 pp. Daniels, R.E. & Eddy, A. 1985. Handbook of European Sphagna. - Institute of Terrestrial Ecology. 262 p.
Lange, B. 1982. Key to northern boreal and arctic species of Sphagnum, based on characteristics of the stem leaves. 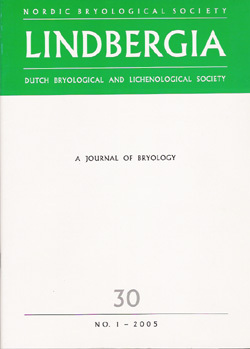 - Lindbergia 8 (1): 1-29. Warncke, E. 1979. Danske tørvemosser. - Natur og Museum 19 (1): 1-18. Damsholt, K. et al. 1980-2018. Den danske mosflora. II. Levermosser og hornkapsler. Damsholt, K. 2002. 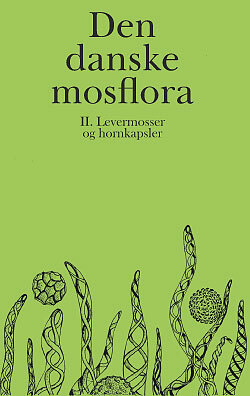 Illustrated Flora of Nordic Liwerworts and Hornworts. Nordic Bryol. Soc., Lund. Schumacker, R. & Vana, J. 2005. Identification keys to the liverworts and hornworts of Europe and Macaronesia (Distribution and status). 209 p.
Casas, C. et al. 2009. Handbook of liverworts and hornworts of the Iberian Peninsula and the Balearic Islands. Institut d'Estudis Catalans, Barcelona. Hallingbäck, T. 2016. 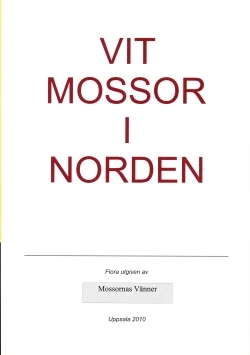 Mossor - en fältguide. Naturcentrum. 356 s.
Skytte Christiansen, M. 1978. Flora i farver 2. Sporeplanter. Politikens Forlag, København. 259 s.
Skytte Christiansen, M. 1981. Bregner, mosser, laver i Mellem-, Nord- og Vesteuropa. G.E.C. Gads Forlag, København. 256 s.
Frey, W., Frahm, J.-P., Fischer, E. & Lobin, W. 2006. The Liverworts, Mosses and Ferns of Europe. Harley Books. 512 p.
Smith, A.J.E. 2004. The Moss flora of Britain and Ireland. Cambridge University Press. 1012 p.
Casas, C. et al. 2006. 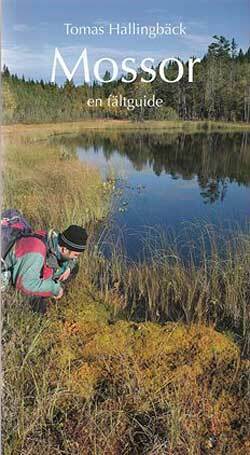 Handbook of mosses of the Iberian Peninsula and the Balearic Islands. Institut d'Estudis Catalans, Barcelona. Jensen, C. 1915-1923. Danmarks Mosser. Bd. 1-2. Gyldendalske Boghandel & Nordisk Forlag, København & Kristiania. Mogensen, G.S. & Goldberg, I. 2005. 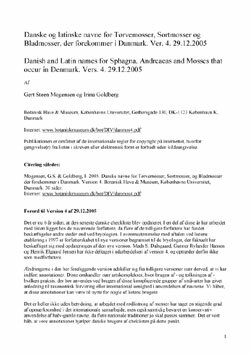 Danske og latinske navne for mosser, der forekommer i Danmark. Damsholt, K., Goldberg, I. & Øllgaard, H. 2008. Danske og videnskabelige navne på levermosser og hornkapsler i Danmark 2008. Hallingbäck, T., Hedenäs, L. & Weibull, H. 2006. Ny checklista för Sveriges mossor. - Svensk Bot. Tidskrift 100(2): 96-148. Hill, M.O. et al. 2006. An annotated check-list of the mosses of Europe and Macaronesia. - J. Bryology 28: 198-267. Holmen, K. (ed.) 1959. The distribution of the bryophytes in Denmark. - Bot. Tidsskrift 55 (2): 77-154. Söderström, L. (ed.) 1995. 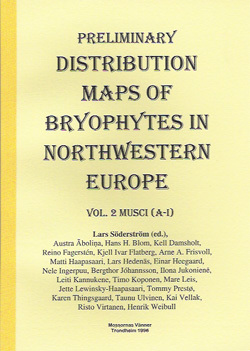 Preliminary distribution maps of bryophytes in Northwestern Europe. Vol. 1. Hepaticae and Anthocerotae. Mossornas Vänner, Trondheim. Söderström, L. (ed.) 1996. Preliminary distribution maps of bryophytes in Northwestern Europe. Vol. 2. Musci (A-I). Mossornas Vänner, Trondheim. Söderström, L. (ed.) 1998. Preliminary distribution maps of bryophytes in Northwestern Europe. Vol. 3. Musci (J-Z). Mossornas Vänner, Trondheim. Schulz, F. & Dengler, J. (eds.) 2006. Verbreitungsatlas der Moose in Schleswig-Holstein und Hamburg. Landesamt für Natur und Umwelt des Landes Schleswig-Holstein, Flintbek. 402 p.
Meinunger, L. & Schröder, W. 2007. Verbreitungsatlas der Moose Deutschlands. Regensburgische Botanische Gesellschaft von 1790 e.V. 3 bd., 2044 s.
Aude, E. & Fuglsang Frederiksen, R. 2015. Mosserne i Nationalpark Thy. Rapport 15-1-2015, Habitat Vision. 151 s.